As I continued up I-101 from my overnight in Shelton, I was in familiar territory. Not only have I traveled the Olympic Peninsula many times while RVing, but in 2010 I spent the summer in and around Port Townsend and it was my privilege to explore more deeply. 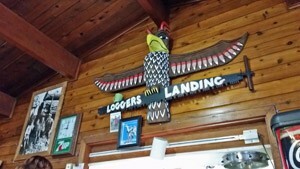 Hunger pains nudged me to stop in Quilcene and choose the Logger’s Landing Restaurant. It just looked the part of a place that served good food…and they did. After ordering, I had time to observe fellow diners. Dining might be a fancy word. They were locals who just walked in, grabbed their own cup from the counter, wiped any residue from the previous morning and filled it on their own. One said, “Gross.” Another, “Aww, it’s just gettin’ ripe!” The good-natured waitress didn’t even bother asking what they wanted. She just told the cook who was there and the cook soon had their breakfast ready to be served. My usual soft-centered eggs spread over hash browns was more than enough to fill me up and my coffee cup was kept to hot and overflowing. The fellows were enjoying their morning camaraderie, exchanging gossip (yes, men gossip) or silliness with the waitress. They were probably all former loggers or if nothing else, they were rustic. If you think Quilcene is a strange name, I had already passed Lilliwaup, Duckabush, and Dosewallips. This is the land of the lush rain forests of Olympic National Park to the left with the Hood Canal to the right as I headed north. Volcano and Tsunami Evacuation signs were the norm, as were the elk crossing signs. The Roosevelt elk, named after President Theodore Roosevelt, are darker and larger than elk found in other parts of North America with an almost white rump patch. 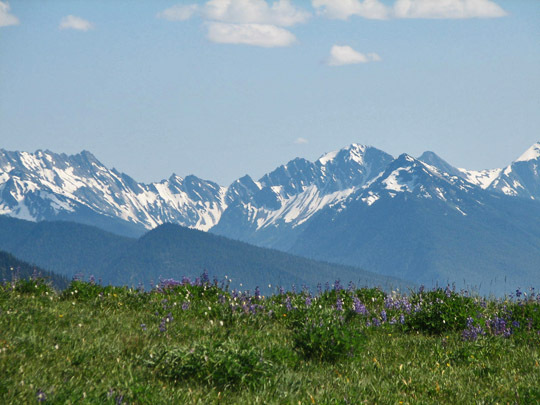 The elk herd, numbering around 5,000 animals, is the country’s largest unmanaged population. I went by a couple more bays, totally fascinated by the mountains ahead, and turned from I-101 on to Washington St. that leads into Sequim. The touristy section of Sequim is a tight, slow-down type of drive where you are careful to allow the tourists (or anybody) to cross the street without seeing fear in their eyes. 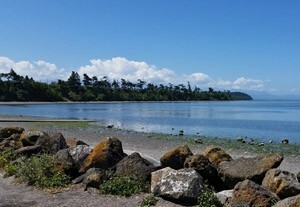 Sequim is a town of around 6,600 and refreshing for one who has lived two hours round trip away from major shopping areas for many years. It has the major box stores as well as Penney’s, Great Clips, lots of restaurants, some quaint, some in the McDonald’s category. And, with having to replace everything I left behind, it has been a novelty to drive a block or two or four to any type of store, bank, or fix-it place I needed. Arriving “Home” doesn’t mean anything yet. I looked at the mileage and I had driven exactly 1,478 miles and it was not yet noon on the fifth day but I was “Home” for whenever my heart arrived. God Bless until next week. Winter in the Wilderness, the first e-book novel published by Minshall, is offered at most Internet book sites. A print edition may be obtained from Amazon. The fourth edition of RVing Alaska and Canada is available through Amazon.com.